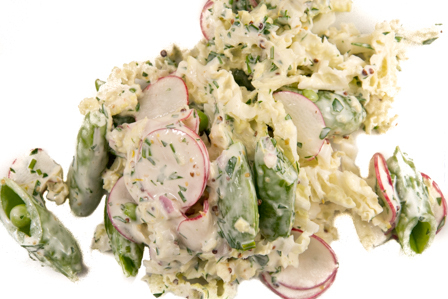 We love this alternative to coleslaw. Goes with the Brown Sugar Baked Beans and Chile-Glazed Baby Back Ribs. Clean and stem snap peas. Slice each pod in half at a 45° angle (do not remove the small inner peas) and transfer to a large bowl. On a mandolin or using a chef's knife, thinly slice the radishes and cabbage and transfer to the bowl with the peas. In a small bowl, whisk together the remaining ingredients until well combined. Pour dressing over salad and toss to combine. Refrigerate until chilled, about 30 minutes. Taste and adjust seasoning with salt and pepper.